Vincent Enyeama has spoken of his great pride at becoming the first goalkeeper to be named French Ligue 1 African Player of the Season. He is also the first Nigerian to win the Marc-Vivien Foe prize, named after the Cameroon international midfielder who died aged 28 of a heart attack in 2003. The Super Eagle has played all 37 league games for his club Lille this season, conceding only 25 goals. He was voted top ahead of Toulouse's Ivorian defender Serge Aurier and Lyon's Cameroon defender Henri Bedimo to succeed last year's winner Pierre-Emerick Aubameyang of Gabon. 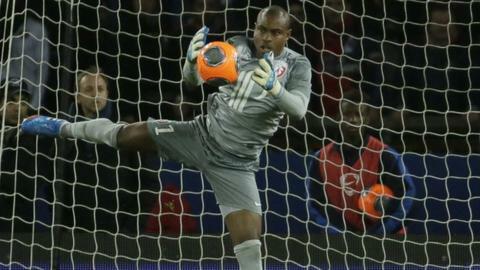 Enyeama told BBC Sport : "It's amazing, a great honour and I deeply appreciate it. I must first give glory to God, my team-mates, family and our beautiful fans for their remarkable support. "It's a reward for team effort and having great people in front of me. Together we've endured a tough but interesting season." He also hopes winning the award will lead to greater recognition for goalkeepers. "It's not easy for goalkeepers to win among outfield players, so this one is special. It will hopefully encourage and open the doors for other players between the sticks," he said. "Outfield players easily get all the plaudits, but those preventing them from grabbing the headlines don't get similar accolades." The award is decided by 60 journalists from all branches of the media and is co-sponsored by Radio France Internationale (RFI) and France24 TV news channel. Meanwhile, the 31-year-old insists he will not be adversely affected by missing out on the French Ligue 1 goalkeeper of the year award. At one point this season - which comes to an end this weekend - Enyeama went 1,062 minutes without conceding a goal in the French top flight. He has been the standout performer for Lille this season, keeping 21 clean sheets, but he was overlooked by his fellow professionals during Sunday's awards, with PSG's Salvatore Sirigu claiming the prize for best stopper in the league. "Obviously, it would have been nice to win it, but I won't let that worry me." he added. "You win some and you lose some. It's not something that is going to affect me. I congratulate the winner Sirigu. I'm proud of what we've done." Enyeama is in Nigeria's 30-man provisional World Cup squad and is expected to be the number one choice for the Super Eagles at the tournament in Brazil.